Assange, 47, was taken into police custody for failing to surrender to bail and on a US extradition warrant, after Metropolitan police officers were invited into the Knightsbridge embassy. He had taken refuge there for almost seven years to avoid extradition to Sweden, where authorities wanted to question him as part of a sexual assault investigation. He was being held on Thursday on a warrant issued by Westminster magistrates court on 29 June 2012, when he failed to surrender to the court. 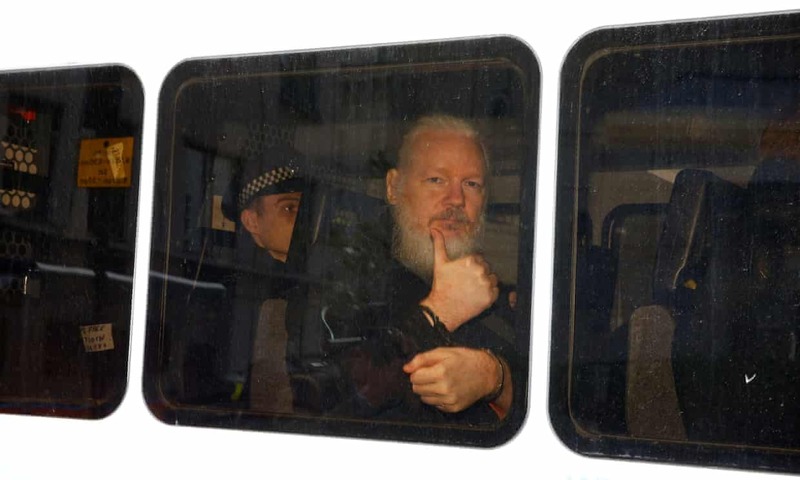 Footage showed Assange, heavily bearded, shouting and gesticulating and being carried out in handcuffs by plainclothes officers and put in a police van shortly after 10am. Speaking to parliament, Theresa May thanked the Met and the Ecuadorian government and said: “this goes to show that in the United Kingdom no one is above the law”. Sweden’s chief prosecutor, Ingrid Isgren, said in a statement the arrest was “news to us” and they were following developments. A preliminary investigation can be resumed as long as the suspected crime is not subject to the statute of limitation, she added. In this case, the suspected crime would be subject to statue of limitations in mid-August 2020. From where I’m sitting, it looks to me like the only people who are celebrating the arrest of Julian Assange, are people who might well be considered to have something to hide. Anything to say Mr. Hunt? The deep state needs something to fill the airwaves after the Mueller report and the Jussie Smollet FF failure to distract the slumbering masses. He, like Snowden, is a stooge and has taken his place on the world stage production of NWO. There will be drama involved in this staged public deception to keep the numbskulls busy thinking about nothing. Weren’t the Swedish charges proved to be a Honey trap ? In the meantime the Cabal will pull all the stops, more false flag attacks, weather warfare, immigrant crisis, economic terror etc. etc. to keep from answering for the plethora of criminal conspiracies that have been ongoing for centuries. It is going to be a very interesting year ! and they wonder why no one votes ? “A lie is a lie even if everyone believes it.. The time has come for the truth to prevail. The United States Of America, has just taken the first serious leap into fascism. With the arrest of Julian Assange, the United States of America has just done exactly what Nazis did with Germany in the 1930’s, by arresting a person who’s only crime was to tell the truth. There is now no hope for anyone in the United States of America to now report the truth. The Bill of Rights of the USA has been totally ignored. That is, US law is now no longer being followed. This is fascism pure and simple. THE UNITED STATES OF AMERICA HAS NOW BECOME A FASCIST STATE. The clock has now started to another World War. The USA has now crossed a line, the same line that the Nazis did with the election of Hitler in 1933 and their ignoring German laws to hunt down and imprison their foes. The next World War, will be a World War to stop the fascist USA. The UN Working Group ruled that Assange ought never to have been arrested in the UK in the first place because there is no case, and no genuine investigation. Read this and you will know why.